The Basic, is great for those who want a cleaner car but do not require the high quality products that our other wash packages offer. The basic wash includes many of the components in the car wash. Your vehicle will receive a simple soap solution, cleaning from our rotating brushes, various power washers, and our tire cleaning power washers. The basic also comes with our spot-free rinse! This system uses ultra purified water to do the final rinse on your vehicle. When the water is dried it does not leave any spots because it is free of minerals that leave pesky water spots. After the rinse your vehicle is dried using 9 jet driers to blow large amounts of residual water off the vehicle. Once you've exited the tunnel and the exterior of your car has been washed, come use our FREE vacuums and mat washer! Rain is a leading cause of dirty cars. The rain dries and leaves dirty spots all over the outside of your car. It also causes mud puddles to collect on the road that dirty your tires. North Gate Car Wash is pleased to bring our customers an affordable solution to these problems! Our Basic Plus and Tire Shine Express car wash combination uses a Rain Repellent formula to keep large amounts of rain from accumulating on your vehicle. This also enhances safety when driving in the rain by allowing higher visibility through the windshield. Tire Shine Car Wash System The Tire Shine system simultaneously cleans your tires and rims with a firm rotating brush and applies our tire shine formula. This process seals your tires and rims to protect against dirt while leaving them it with an unbelievable shine! The Hot Wax and Shine car wash package brings together the famous Blendco Car Wax and the convenience of an automated car wash! 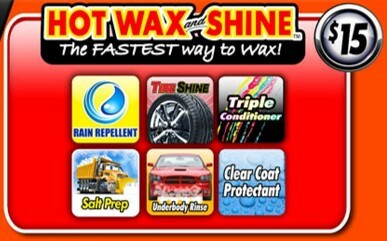 HotWax is applied to the vehicle to create a long lasting shine and a dirt resistant surface. This wash package also includes everything from the Rain Repellent and Tire Shine combination, along with Triple Foam, Clear Coat Protectant, Underbody Rinse, and Salt Prep! Our VIP Express includes our premier paint sealant process. It brings together an advanced set of products that delivers a noticeable difference in the shine of the vehicle with every wash. The Durashield process consists of 4 parts. The Rhino Foam Bath, a foam waterfall that covers your car in cleaning foam, the Tri-Color Rhino Shine, a process that uses products to add extra shine to your car's paint, the Durashield Protectant with Body Armor, which adds a layer of protection to help prevent dirt from lingering on your car, and a Rinse & Cure waterfall, which washes off the excess cleaning products to leave your car spot free. 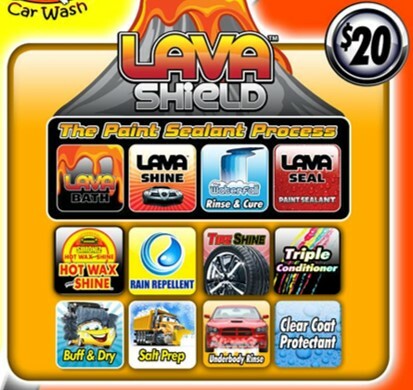 This car wash package also includes Buff & Dry, Triple Polish, Rain Repellent, and Salt Prep!